What Are ERP Software and Services? When you run a business, each moving part needs to work together to achieve productive goals and hit key performance indicators. 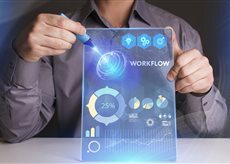 ERP, or enterprise resource planning, software and services are designed to give you the tools to create workflows and asset sharing between all the important sections of your large company. The following aspects of ERP software will explain many of the important functions it provides to companies. At the heart of ERP software is a shared database. When business units, like a human resource department, accounting, or inventory management, need to look at business data, sending large files can cause production blocks. If there’s too much data, it becomes unwieldy, especially if a business has multiple, non-local networks. With ERP, employees in different divisions in multiple locations can access information for their needs. Say you want to know each month what your facility expenditures are. In bygone years, an employee would have to gather and collate data, and then send out the reports to any departments that might need it. Today, ERP software can generate monthly or yearly reports automatically. That data is packaged in useful ways and then sent to a list of employees or departments. With these types of software and services, employees don’t need to manually enter numbers or maintain huge databases. Any company dealing with large bundles of information, like technology startups, can use ERP to streamline processes. ERP for startups means less time focusing on data capturing and more time using the analysis to create business results. Because the software comes pre-developed and designed with employee and manager ease of use in mind, a new business can get a leg up by investing in an industry that’s characterized by innovation and quick thinking,ERP software and services are a must.